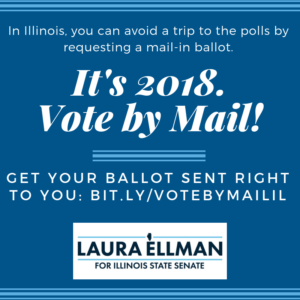 In Illinois, every voter has the opportunity to request a mail-in ballot. Once you apply, you will receive a ballot straight to your home. This gives you the ability to vote at your convenience and saves a trip to the polls. It is also a more secure way to vote, as your ballot gets counted when it gets in rather than in the crush of votes on Election Day. It’s super easy to do, simply fill out the form here. If you have not yet registered to vote, you can do that here.